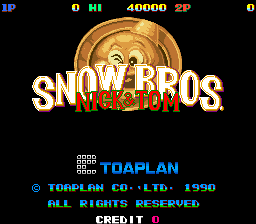 Inspired by Bubble Bobble, Snow Bros is a 50-stage single-screen platformer in which you wipe out enemies by covering them up with snow and rolling them up into balls... to their death! Do note that the game kind of has... well, let's just say some minor leeching issues. It's possible to earn big points on the boss stages, as the time limit is pretty generous and when the timer runs out on a boss, it just kicks you ahead to the next stage anyway. 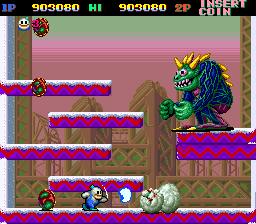 The top score on MARP demonstrates what appears to be a very controlled technique for leeching on the last boss as there does not seem to be a timer for the last stage. I'm not 100% sure if it is indeed an "infinite" leech, but seeing as there has no been ruling for it on MARP, and the difficulty in which it takes to get to the last stage, plus the fact that you are putting yourself at risk to pull it off... we will let it slide. I don't think it will be an issue, hopefully I won't be proven wrong! This is the beginning of the elimination bracket, the round of 32. You must defeat your opponent's score to advance to the next round. I would have been good at this round! Phil Lamat, is a pleasure for me to play against the number 1 of Marp leaderboard. Interesting choice have never even played this sort of game before. Game on! Hm, seems nice, I'm not a beast in these games but I like them. I said nothing yet about it but I'm displeased to see what happened with Pengafin (if it's true, and I think it is). Not because of the player, but because of the fact happened, I mean, these things should not happen. To give an idea of my disappointment, let me say that, to play fair and trying to be also good, I stay awake to play in the night with a 10-years-old pc in a cold room with frameskip to enable for 20% of the games to maintain a regular speed, and then? I see a player doing in a day 4/5 of what I did in six days, daring to say on the INP comment that he made the scores with just two plays (and I look to my counter... 90+ plays not counting the real credits used with exercise...), and this already sounds unreal somewhere. Who cares actually of the cold room or the old pc (nobody forces me to play ), what I can't stand is that you dared to compare yourself to others in a "I am superior" way and it comes out that you cheated! giro-X wrote: Hm, seems nice, I'm not a beast in these games but I like them. My opponent looks like he is also good at this game with an even higher score than Sawys but then again it was set 13 years ago. Fingers crossed he hasn't been improving all those years. But hey I'll give it a bash anyway!! I will try to play with you as fair as possible. I edited my old score /10 to be sure i cand upload the score of the k10 on the officiel leaderboard. The last boss does eventually time out. You are not able to infinitely leech. This game is regular, no infinite pattern. Last Boss have leeching for 17/18 minuts, then self destruction and +200.000. Why there isn't the live scoreboard link? chrisbo wrote: My opponent looks like he is also good at this game with an even higher score than Sawys but then again it was set 13 years ago. Fingers crossed he hasn't been improving all those years.